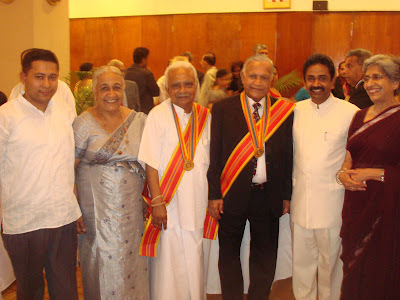 Dr. A. T. Ariyaratne, founder of Sarvodaya Shramadana Movement, received Sri Lankaabhimanya (Pride of Sri Lanka), country’s highest honour today. I had the privilege of witnessing the event Presidential Secretariat in Colombo when Sri Lankan President Mahinda Rajapkase conferred the highest honour to Dr. Ariyaratne. Dr. Ariyaratne was recognized for exceptional honor and glory brought to the country through Sarvodaya Shramadana Movement. The proclamation to the honour recognizes Dr. Ariyaratne’s five decades long service to upliftment of socially marginalized and oppressed, and his unwavering commitment to non-violent transformation of societies. In recognition of the exceptional honour and glory brought to the motherland by his pioneering endeavors in establishing, and carrying forward for five decades, the Sarvodaya Movement for livelihood development of the socially oppressed and marginalized, and peace and co-existence; and by the many international accolades received for using his vision of Ahimsa based on Buddhist and Gandhian principles for the benefit of world community, especially in the search for peace and non-violent social transformation, a grateful and appreciative nation hereby confers on Deshabandhu Ahangamage Tudor Ariyaratne, the highest national honour of Sri Lankabhivmanya. After the honor ceremony, there was a private reception where Dr. Ariyaratne introduced me to the President saying that I was Executive Director of Sarvodaya USA and that I am from Nepal.